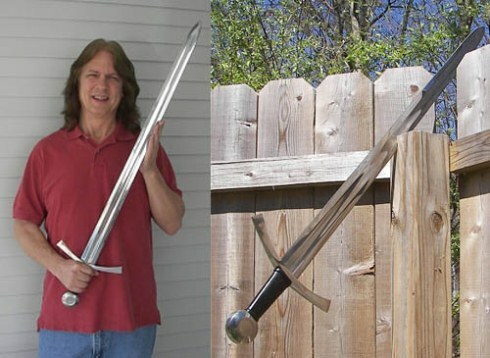 The Classic Windlass medieval sword is one of the few swords made by this sword maker that has been around for years - arguably, because they got it right the first time, and most collectors have owned one at least once.. I purchased my first "real" sword, a Hanwei Practical Single-Hand Sword, a couple of years ago. Since then I have purchased several of the Hanwei Practical series swords, and I also own an Arms & Armour Fechterspiel Sword. I needed the blunt bladed swords since the training I have taken and sparring I do with my son-in-law requires them. Recently I decided that I wanted to own a sharp sword, if for nothing else, to be able to show my family and friends what a sword that a person of old might of actually owned. Another reason I wanted a sharp sword was to be able to do some cutting with full force swings, my son-in-law doesn't appreciate if I hit him full force, even with a blunted sword. I like the type Oakeshott type X blades, and wanted something a 13th century knight might carry. This does not mean that I don't like other types of swords, I would own one of each if my funds would allow. My first requirement was that the sword had to look good to me. This is totally personal, but I wasn’t going to buy a sword that I didn't like the looks of. It also needed to be constructed in a way and from a company that would offer a sword I would trust for cutting. The last requirement was budget. I had about $200 in birthday money that was burning a hole in my pocket and I wanted the purchase price to be $200 or less. I spent a week or so doing research, from the internet stores themselves, and the SBG sword forum. I found 3 or 4 swords that I liked, that fit my budget, and that I would feel comfortable cutting some plastic and the occasional watermelon (I have always wanted to cut a watermelon). I kept going back and forth among these swords and finally decided on the Windlass Classic Medieval Sword. "This sword is an Oakeshott Type X with a Type I pommel and a Type VII crossguard. The long and wide fuller on this blade lightens the overall sword and makes it possible to deliver fast and shearing cuts capable of cutting through the mail and padding that were worn during the period. 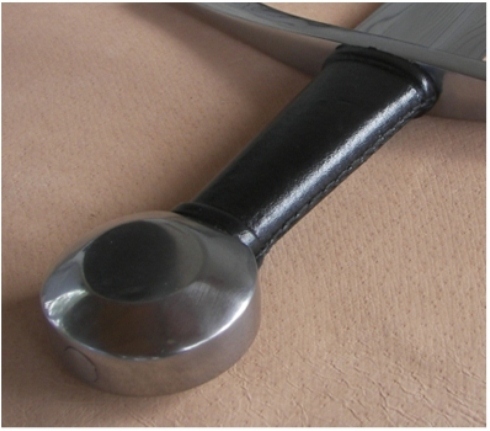 The long guard offers good protection from an opponent's shield or blade while the classic wheel pommel brings the sword very nicely into balance. This type of sword was in service for a long period of time throughout all of Europe. Made by Windlass Steelcrafts." For the most part their description is pretty accurate. They offer this sword more as a generic medieval sword, and they are not basing their description on one particular sword. I will agree that this sword looks like a sword that could have been used during the 13th century. I was excited about getting the sword into my hand. I pulled the sword out of the sheath, and held the sword up as if I was holding Excalibur. Now this felt like a sword and it was sharp! The blade was thinner then my blunted blades (but of course), and it just looked and felt like a sword to take into battle. I did notice though that every time you unsheathe the sword that leather powder sticks all over the blade and you need to wipe the blade down to clean it off. I will describe the scabbard in more detail later. I will give as many "facts", photos, and statistics as possible to minimize my own personal opinions. The blade on this sword measures 33 inches and has a nice wide fuller. The blade measures 1.93 inches wide at the guard and tapers to 1.54 inches right before the blade is shaped for the tip. The fuller measures 0.83 inches wide at the guard and tapers slightly towards the tip. The fuller runs for most of the length of the blade. At the guard the blade thickness is 0.165 inches and tapers to 0.122 inches near the point. This is not a lot of distal taper, but it is a fairly thin blade. I would describe the blade geometry as being a broad-fullered Oakshott type X. The fuller runs very straight by looking down the blade, it is evident that this blade was hand forged and not machined, no hammer marks, just the handmade look. Actually this was what I was looking for. My own personal taste prefers the handmade look. The overall finish is very nice. There were a few scuffs and scratches on the blade but nothing that I would consider imperfections. As I mentioned I ordered this sword with the sharpened option and the sharpening appears even, fairly sharp, and since this is a thinner blade, transitions nicely. The blade comes with the standard Windlass sticker (which I removed after taking some pictures), and on the opposite side of the blade near the guard "Windlass, Made in India" is etched in the blade, but it is very small, light and hardly noticeable. The blade flexes but does not feel wobbly, and returns to straight. In fact trying to figure out the center of percussion was a bit of a job as the blade would only vibrate a few times before going stiff again. Honestly I don’t know if this is good or bad, but I like it. I would not call this blade stiff, but it is also not wet noodle like. The grip measures 3.875 inches long and fits in my hand nicely. It is covered with black leather and sewed on the side. The leather is tight and sewed well. I cannot move it by twisting it as hard as I can. There were a few minor dings in the leather, and in one place it looks like a little bit of something was left on the wood before covering it with the leather and it left a little bump. This sword comes with a hefty guard. It certainly gives you the feeling that it would easily stop another blade. It is finished nicely, again with some very minor scuffs. It measure approximately 9 inches wide and is very thick at the grip. It is tightly attached and feels solid. 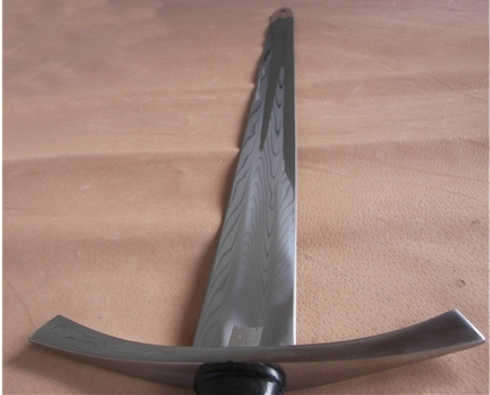 As can be seen in the photos the guard is curved and tapers to a much thinner profile at the ends. This could do some damage to your opponent if during sparing you used the sword like an axe. Remember the blade isn't the only part of the sword that can be used as a weapon. 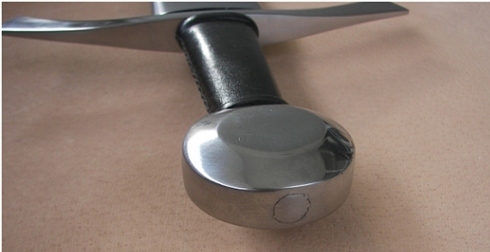 The photo below shows the slot in the guard for the blade. As can be seen the slot is a bit wider than the blade by about a 1/8 inch on either side. But again there is no movement and the blade is centered. I can't really show this in a picture but the blade fits tightly against the bottom of the slot. I do not hear any of the telltale sounds that a loose hilt makes when the sword hits something such as rattling sounds or those unsettling vibrations. The pommel is nearly circular and again finished nicely. It is a little over 2 inches in diameter and 1 inch thick. It is peened and the peen, though not perfect, is finished nicely. No cracks or hammer marks. The sword comes with a black leather scabbard with a metal chape and metal locket. It is an all leather scabbard with no wood core. The interior leather is not finished in any way. There are two problems with this, one is that every time you pull the sword out it is covered with leather dust, and two, leather is not good to store your metal sword against. It is sewed up the back and a couple of stitches were missed. Actually it is not a bad looking scabbard, and would be fine for costume wear. I don't believe it is historic to the sword though. I had already planned on making a wood cored leather laced scabbard for this sword so the scabbard had no effect on my buying decision. Before we go into the handling of the sword it might be helpful to know a bit of my background so you can better judge my opinion. I am about 6'2" and weigh in around 190 lbs. I have taken German Long sword WMA training so I am used to a large sword. With that said I really like the way this sword fits in my hand. This sword is fairly long and heavy. It is a tad bit over 3 lbs and an overall length of 39 inches. I really thought it would feel awkward when I picked it up but it didn't. It seems pretty well balanced and I am surprised that it weighs 3 lbs. I have picked up lighter swords that I have to grip much tighter to keep it balanced. I can swing it pretty hard and stop it where I want. All this with one hand. The point of balance is about 6 inches from the guard which helps making it not feel too blade heavy. I assume the large guard and nice size pommel assist in the balance. I would not consider it a light, nimble sword, more in the “basher” class, but whatever you hit with it will know it has been hit. Is it perfectly balanced? No, I would lean towards a bit blade heavy, and if the point of balance was say, 5 inches, it would be hard to fault. Not bad for a large sword at this price point. 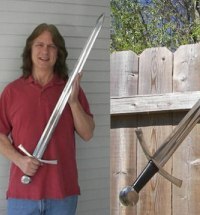 I have included a picture of myself holding the sword to show the size of the sword. It feels like it would make a good cutter. Let's fill some bottles and find out. Another disclaimer.. this was my first time ever swinging a sharp sword at an object... Oh yes, I LIKED IT!!! 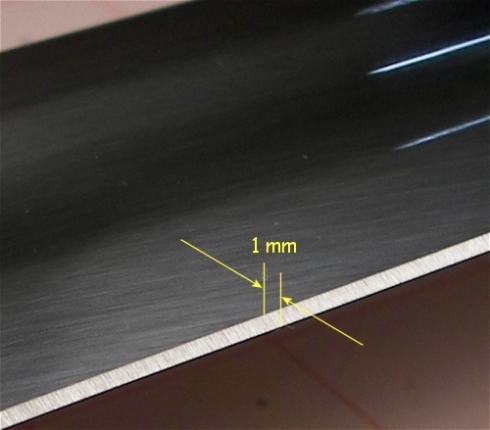 The picture below shows a closeup of the sharpened edge. I have not seen this sword unsharpened but by examining the profile of the blade the edge would have been pretty small. It is hard to really see the sharpened bevel on the edge without really looking close. In other words the sharpened portion of the blade transistions nicely into the rest of the blade. I feel this blade was designed to be sharpened! I understand now what the thrill about cutting is. I just had never really thought about it before. Before I did cut I made sure I had a clear area, the dog was in the house and no one else was around. I read over a lot of the rules and suggestions from this site and I would highly recommend that you do the same before you start cutting. 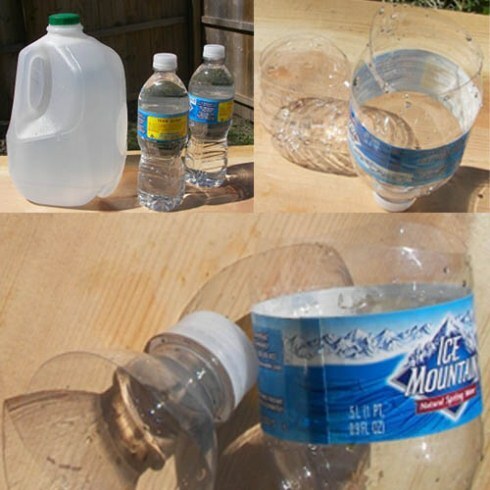 The sword flew through both the bottles and the milk carton. I didn’t feel any resistance and all the cuts were very clean. The sword felt like an extension of my arm and I hit the bottles and cartons pretty much where I was aiming. The first cut on the milk carton was when it was full of water (the top cut ), the next cut on the milk carton (bottom) it was nearly empty, about an 1" of water in the bottom. These cuts were also very clean, I saw no tear outs at all except one small spot on the handle of the milk carton. I asked the question earlier: "Did I make the correct choice? ", and yes, I did. I like this sword. I wouldn't have taken the time to do this extensive of a review if I hadn't liked it. This sword just feels right in my hand, I like the way it looks, and this sword is a good value for the money. I didn't find anything cheap or sub-standard in the construction. I understand that Windlass quality can vary a bit, but it looks like this particular sword made it to the upper end of the quality curve. A wood core scabbard would be a nice addition but would probably up the price a bit. I hope this review of the Classic Medieval Sword has been helpful. 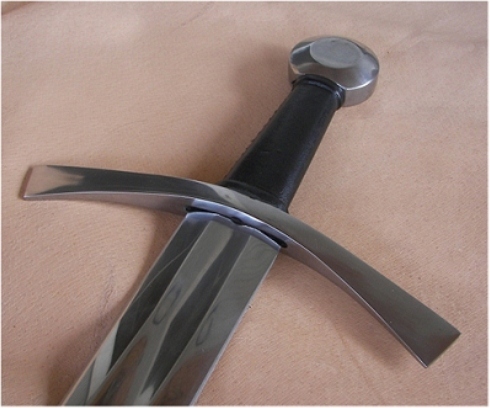 To return to Affordable Replicas of Medieval Swords from Windlass Classic Medieval Sword Review, click here.